Sting and Trudie Styler's Il Palagio wine, exclusive Lagunitas Willettized beer & Sheryl Crow's HSN apparel line at Bourbon & Beyond. 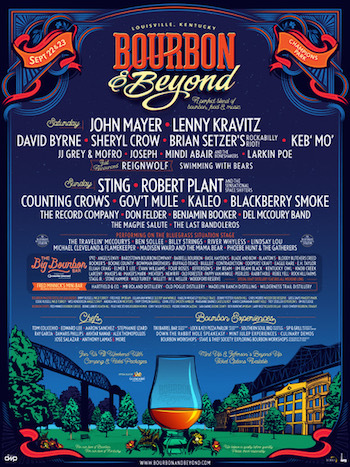 Wine from Sting and Trudie Styler's private estate and an exclusive Lagunitas beer will be served at the second annual Bourbon & Beyond, returning to Louisville's Champions Park on Saturday, September 22, and Sunday, September 23. The weekend offers the perfect blend of bourbon, food & music not found anywhere else in the world, assembled by festival producers Danny Wimmer Presents along with culinary curator Edward Lee and bourbon curator Fred Minnick. "What a surprise and honor to be asked by Bourbon & Beyond to present our Il Palagio wines at this year's festival," Trudie Styler said. The Villa Il Palagio estate is the home of Sting and his wife Trudie Styler, nestled in the rolling hills of Tuscany. "Il Palagio is one of my favorite places on Earth. I hope you fall in love with our wine as much as I have," Sting added. The remarkable sixteenth-century estate has been completely renovated and includes 65 acres of vineyards, 8,000 olive trees and 80 bee colonies. All wines produced at Il Palagio are organic and certified by BioAgricert. Headlining Sunday's musical lineup, Sting said he is excited to introduce Roxanne, a new addition to Il Palagio's Tuscan reds, which also includes Sister Moon, When We Dance and Casino delle Vie. Il Palagio Roxanne Bianco, Il Palagio Roxanne Rosso and Il Palagio When We Dance Chianti will be available at select General Admission bars. In the Jefferson Beyond VIP area, attendees can enjoy Il Palagio Casino delle Vie and Il Palagio Sister Moon. For more information about Villa Il Palagio, visit http://www.il-palagio.com/. To locate Il Palagio wines in the United States with Taub Family Selections, visit https://www.taubfamilyselections.com/producers/il-palagio. Meanwhile, Lagunitas will offer their Willettized Coffee Stout. 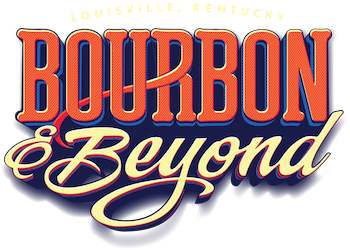 Bourbon & Beyond is the only place people will have access to this year's batch prior to its public release later this year. Willett Distillery provides the barrels and Lagunitas fills them with Imperial Stout, creating a chocolatey, coffee-y, smoky, bourbon-y beast of a barrel-aged beer. Not sure what to wear for the festival? Check out Sheryl Crow's vintage-inspired line available through HSN. Crow's style is feminine with a rock 'n' roll twist, creating effortless style for every day. The festival look book showcases outfit options to wear for all days of the event, including Friday's "For Our Love of Kentucky" events and both days of the festival. See the collection online at https://www.hsn.com/shop/sheryl-crow/16123 or catch Sheryl Crow on Home Shopping Network during any of her appearances below. Crow is part of Saturday's musical lineup, which includes sets by John Mayer, Lenny Kravitz, and David Byrne. Sunday is headlined by Sting, Robert Plant And The Sensational Space Shifters, and Counting Crows. 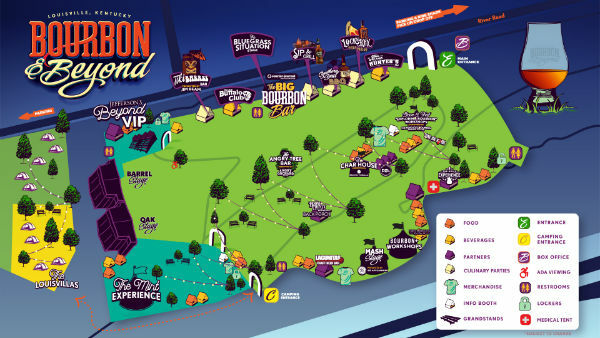 In addition to many more musical performances across three stages, there are workshops from the many distilleries present at the festival in the Bourbon+ Workshop Tent, plus demos from culinary experts Tom Colicchio, Stephanie Izard, Aarón Sánchez and Ray Garcia on The Mash Stage.